This is one of the most important events of the year and takes place in July at St Peter and St Paul Church in Tring. Over 250 students will have been selected across Years 7-10 for attainment or effort in a subject. There are also Special Awards that recognise achievement in a number of specialist areas together with a Heads of House Award for the student who has made an outstanding contribution. Parents are invited to see their child collect an award. Students from the previous Year 11 are invited back in November to receive their GCSE Certificates. Parents are invited to this informal event which provides an opportunity to meet friends who have perhaps moved on to apprenticeships or college. Students from the previous Year 13 are invited back in November to receive their A Level Certificates. This is a great social occasion, with parents also invited, because the vast majority of these students will not have seen one another since the summer due to moving on to university or employment. 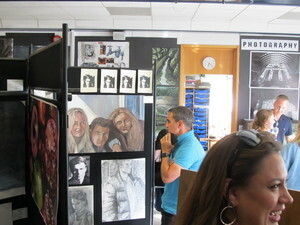 GCSE and A Level exam pieces are on display for the examiners, then the Art Department open their doors for the general public to come and see the fantastic work the students have prepared for their exams. This is an opportunity to celebrate the sporting successes of the year and to thank the students for their hard work and commitment. Students from Years 7-10 and their parents are invited to the evening to receive awards and trophies and to listen to a guest speaker. Familys are invited to walk around the D&T rooms and marvel at the array of projects students have worked on during the year, watch the fashion show, produced and starring students modelling this years textile creations then celebrate the awards while enjoying treats from the Food Technology students. The one time in the school year when all our students gather together in the Desborough Hall for a review and celebrate the year. Staff and student achievement and service is recognised and farewells said to colleagues moving on. There are weekly assemblies House assemblies which follow a theme and always have a focus on Celebrating Student Success. To complement these successes there are A2 posters around the school displaying photographs of these student achievements. In addition at the end of each term there is a House Celebration assembly devoted to recognising the achievements of hundreds of students throughout the term.